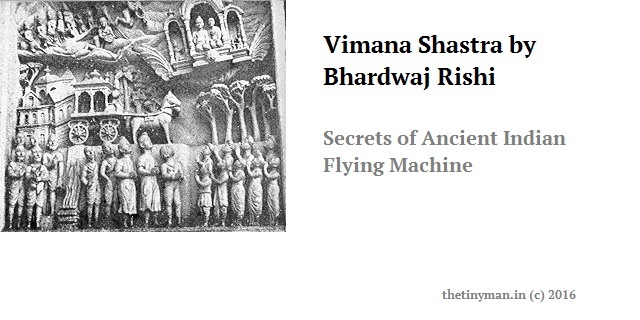 In this post I will talk about Vimana Shastra by Bhardwaj Rishi and reveal the secrets of Ancient Indian Flying Machines. 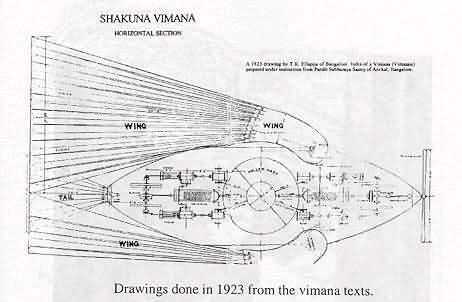 Vimana Shastra is an ancient Sanskrit text on aerospace technology. It was composed by an ancient Scientist-Philsopher called Bharadwaj. Nearly every Hindu and Buddhist in the world - hundreds of millions of people has heard of the ancient flying machines referred to in the Ramayana and other texts as vimanas. 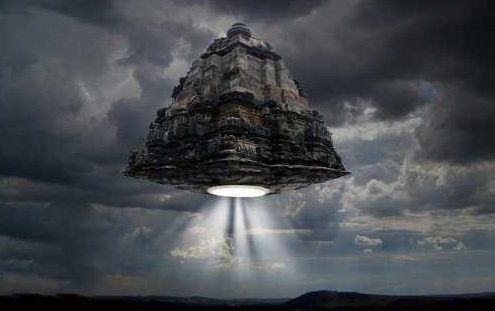 The Vimana is simply a synonym for flying machine. It occurs in the Yajurveda, the Ramayana, the Mahabharata, the Bhagavata Purana, as well as in classical Indian literature. Aircraft was used extensively during Ramayana and Mahabharata time indicating that the aeronautics was a much developed branch by that time. The Yujurveda quite clearly tells of a flying machine, which was used by the Asvins (two heavenly twins). 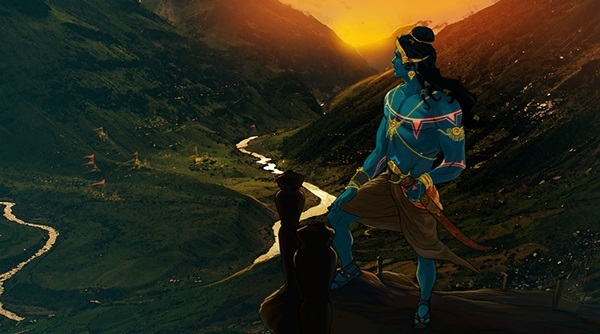 According to Ramayana, Ravana used pushpakavimaana, which was captured from Kubera. However, Rama took charge of this aircraft, after killing Ravana and used it to reach Ayodhya along with Lakshmana, Seeta and his others. The Puspaka Car, that resembles the sun and belongs to my brother, was brought by the powerful Ravan; that aerial and excellent car, going everywhere at will, is ready for thee. That car, resembling a bright cloud in the sky, is in the city of Lanka. When the Daityas were being slaughtered they again took to their vimana and, employing the Danava science, flew up into the sky . . . I (Arjuna) assaulted their vimana . . . Wounded by the flight of deadly-accurate iron missiles, the Asura vimana fell broken to the earth . . . Matali swiftly descended earthward, as in a steep dive, on our divinely effulgent car. Gayopakhyaana, in Mahabharata, also talks of using aircraft. Karna took up that fierce weapon, which resembled the tongue of the Destroyer or the Sister of Death. That terrible and effulgent dart, Naikartana, was hurled at the Rakshasa. Beholding that excellent and blazing weapon . . . the Rakshasa began to fly away in fear . . . Destroying that blazing illusion of Ghatotkacha and piercing right through his breast that resplendent dart soared aloft in the night . . . Ghatotkacha, then uttering diverse roars, fell, deprived of life by the dart of Sakra. The vimana had all necessary equipment. It could not be conquered by the gods or demons. And it radiated light and reverberated with a deep rumbling sound. Its beauty captivated the minds of all who beheld it. Visvakarma, the lord of its design and construction, had created it by the power of his austerities, and its outline, like that of the sun, could not be easily delineated. And he also gave [unto Arjuna] a car furnished with celestial weapons whose banner bore a large ape . . . And its splendour, like that of the Sun, was so great that no one could gaze at it. It was the very car riding upon which the lord Soma had vanquished the Danavas. Resplendent with beauty, it looked like an evening cloud reflecting the effulgence of the setting Sun. Bhima flew along in his car, resplendent as the sun and loud as thunder . . . The flying chariot shone like a flame in the night sky of summer . . . it swept by like a comet . . . It was if two suns were shining. Then the chariot rose up and all the heavens brightened. And on this sunlike, divine, wonderful chariot the wise disciple of Kuru flew joyously upward. When becoming invisible to the mortals who walk the earth, he saw wondrous airborne chariots by the thousands. And the celebrated Arjuna, having passed through successive regions of the heavens, at last beheld the city of Indra. And there he beheld celestial cars by thousands stationed in their respective places [an airport?] and capable of going everywhere at will, and he saw tens of thousands of such cars moving in every direction. 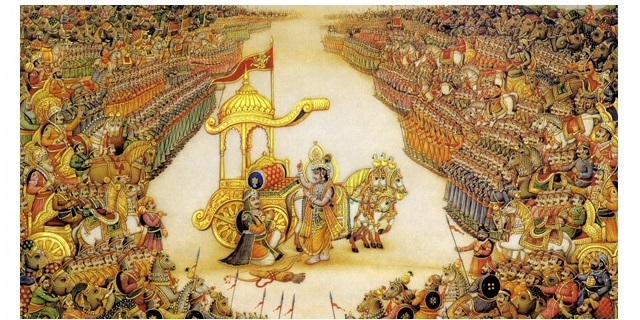 And having vanquished his foe, Krishna furnished with weapons and unwounded and accompanied by the kings, came out of Girivraja riding on that celestial car . . . upon that car Krishna now came out of the hill-fort. Possessed of the splendour of heated gold, and decked with rows of jingling bells . . . always slaughtering the foe against whom it was driven, it was the very car riding upon which Indra had slain ninety-nine Asuras of old. And thereupon that best of cars became still more dazzling with its splendour and was incapable of being looked at by created beings, as the midday sun surrounded by a thousand rays . . . And Achyuta, that tiger among men, riding with the two sons of Pandu upon that celestial car . . . coming out of Girivraja, stopped (for some time) on a level plain outside of town. We beheld in the sky what appeared to us to be a mass of scarlet cloud resembling the fierce flames of a blazing fire. From that mass many blazing missiles flashed, and tremendous roars, like the noise of a thousand drums beaten at once. And from it fell many weapons winged with gold and thousands of thunderbolts, with loud explosions, and many hundreds of fiery wheels. Loud became the uproar of falling horses, slain by these missiles, and of mighty elephants struck by the explosions . . . Those terrible Rakshasas had the shape of large mounds stationed in the sky. Vimanas, decked and equipped according to rule, looked like heavenly structures in the sky . . . borne away they looked like highly beautiful flights of birds. Having spoken thus, Maharaja Nirga made a complete circle around Lord Krishna and touched his crown to the Lord’s feet. 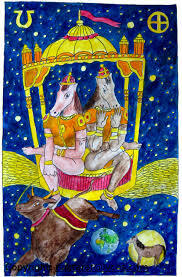 Granted permission to depart, King Nirga then boarded a wonderful celestial car as all the people looked on." "While Dhruva Maharaja was passing through space, he saw, in succession, all the planets of the solar system, and on the path he saw all the demigods in their vimanas showering flowers upon him like rain." Says Andrew Tomas .."If this is the science fiction of antiquity, then it is the best that has ever been written." According to studies by the Indian Institute of Science and Aeronautical Society of India, Maharishi Bharadwaaj's Vymanika Shastra (science of aeronautics) is a pioneering work. 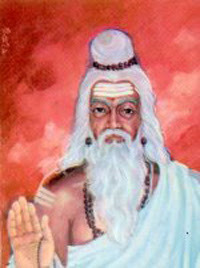 Bharadwaaj, a Vedic scholar who lived thousands of years before modern aviation took off, not only thought about flying an aircraft but also deliberated on detecting and attacking an enemy aircraft using poisonous gases.However, Kota Harinarayan, considered the father of the LCA, had told TOI there isn't much knowledge about the technology Bharadwaaj had thought about, conceding that lack of good research has hurt us.Vymanika Shastra, recovered between 1860 and 1865, even has diagrams of aircraft auto pilot features, which became a reality only a few decades ago. The handwritten Sanskrit manuscript was first translated into English by GR Josyer, the founder-director of International Academy of Sanskrit Research, following which several studies have cited it. Vaimanikashastra deals with aeronautics, including the design of aircraft, the way they can be used for transportation and other applications, in detail. The knowledge of aeronautics is described in sanskrit in 100 sections, eight chapters, 500 principles and 3000 slokas. 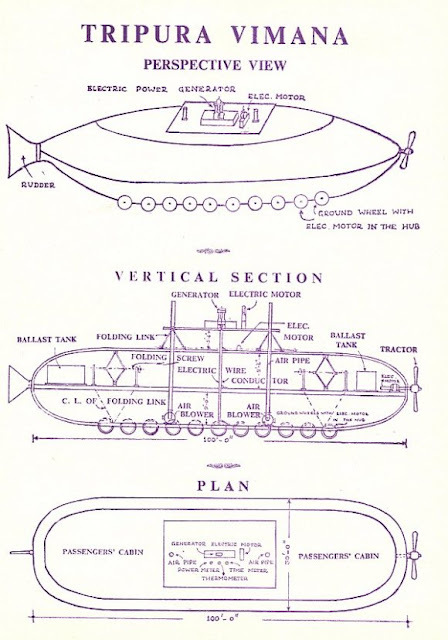 It explains the construction of aircraft and way to fly it in air, on land, on water and use the same aircraft like a sub-marine. He also described the construction of war planes and fighter aircraft. To glibly characterize everything found in this literature as imaginary and summarily dismiss it as unreal has been the practice of both Western and Eastern scholars until very recently. The very idea indeed was ridiculed and people went so far as to assert that it was physically impossible for man to use flying machines. Says Dr. Dikshitar: " …the flying vimana of Rama or Ravana was set down as but a dream of the mythographer till airplanes and zeppelins of the present century saw the light of day. The mohanastra or the “arrow of unconsciousness” of old was until very recently a creature of legend till we heard the other day of bombs discharging Poisonous gases. We owe much to the energetic scientists and researchers who plod persistently and carry their torches deep down into the caves and excavations of old and dig out valid testimonials pointing to the misty antiquity of the wonderful creations of humanity." Dikshitar mentions that in Vedic literature, in one of the Brahmanas, occurs the concept of a ship that sails heavenwards. "The ship is the Agniliotra of which the Ahavaniya and Garhapatya fires represent the two sides bound heavenward, and the steersman is the Agnihotrin who offers milk to the three Agnis. Again, in the still earlier Rig Veda Samhita we read that the Asvins conveyed the rescued Bhujya safely by means of winged ships. The latter may refer to the aerial navigation in the earliest times." Charles Berlitz, author of several books, including The Bermuda Triangle wrote: The Jyotish (400 B. C) echoes the modern concept of the earth's place in the universe, the law of gravity, the kinetic nature of energy, and the theory of cosmic rays and also deals, in specialized but unmistakable vocabulary, with the theory of atomic rays. And what was thousands of years before the medieval theologians of Europe argued about the number of angels that could fit on the head of a pin. Indian philosophers of the Vaisesika school were discussing atomic theory, speculating about heat being the cause of molecular change, and calculating the period of time taken by an atom to traverse its own space. The difficulty we are faced with today is basically that the texts mention various metals and alloys which we cannot translate. We do not know what our ancestors understood by them. Hence it is not fair to cricize something like Vimana Shastra which we do not understand. The secrets of constructing aeroplanes, which will not break, which cannot be cut, will not catch fire, and cannot be destroyed. The secret of hearing conversations and other sounds in enemy places. The secret of retrieving photographs of the interior of enemy planes. The secret of ascertaining the direction of enemy planes' approach. 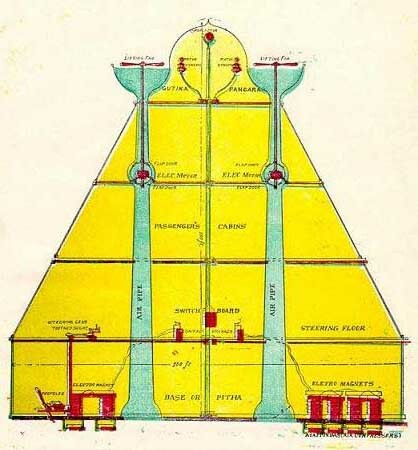 The book dealt with the operation of ancient vimanas and included information on steering, precautions for long flights, protection of the airships from storms and lightning, and how to switch the drive to solar energy, or some other "free energy" source, possibly some sort of "gravity drive." Vimanas were kept in Vimana Griha, or hanger, were said to be propelled by a yellowish-white-liquid, and were used for various purposes. 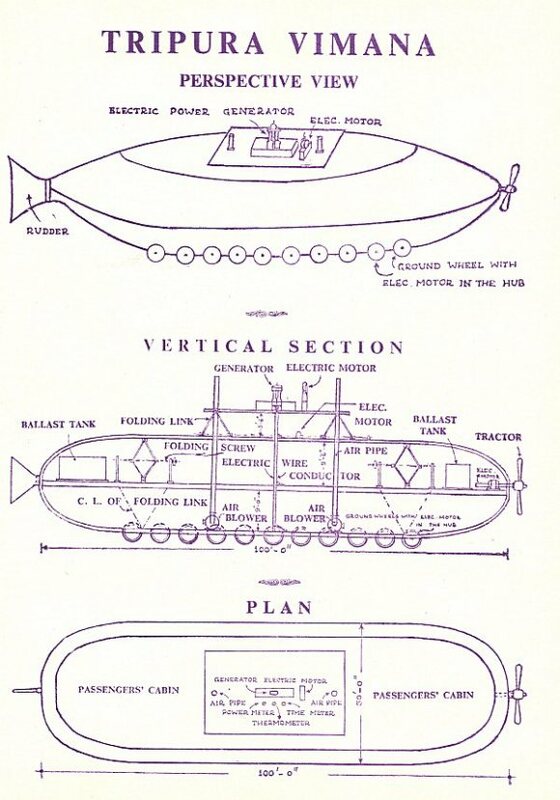 Airships were present all over the world. 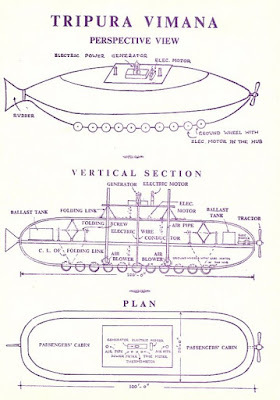 Vimanas were said to take off vertically or dirigible. Bharadwaj the Wise refers to no less than 70 authorities and 10 experts of air travel in antiquity. 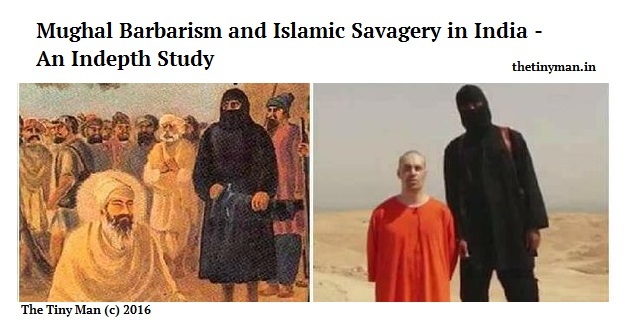 Unfortunately these sources are now lost beacuse of the savagery of 1000 years of Islamic rule when millions of people including Brahmin-Scientists, Kshatriya-Warrior-Philosophers etcwere killed, thousands of cities and hundreds of libraries were burnt and razed. Military Planes had to be: Impregnable, unbreakable, non-combustible and indestructible capable of coming to a dead stop in the twinkling of an eye; invisible to enemies; capable of listening to the conversations and sounds in hostile planes; technically proficient to see and record things, persons, incidents and situations going on inside enemy planes; know at every stage the direction of the movement of other aircraft in the vicinity; capable of rendering the enemy crew into a state of suspended animation, intellectual torpor or complete loss of consciousness; capable of destruction; manned by pilots and co-travelers who could adapt in accordance with the climate in which they moved; temperature regulated inside; constructed of very light and heat absorbing metals; provided with mechanisms that could enlarge or reduce images and enhance or diminish sounds. 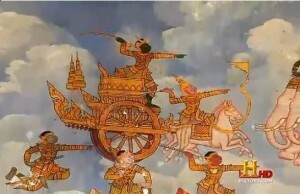 In the Amarangasutradhara five flying machines were originally built for the gods Brahma, Vishnu, Yama, Kuvera and Indra. Later there were some additions. Four main types of flying Vimanas are described: Rukma, Sundara, Tripura and Sakuna. The Rukma were conical in shape and dyed gold, whereas the Sundata were like rockets and had a silver sheen. There were 113 subdivisions of these four main types that differed only in minor details. The position and functioning of the solar energy collectors are described in the Vaimanika Shastra. It says that eight tubes had to be made of special glass absorbing the sun’s ray. A whole series of details are listed, some of which we do not understand. 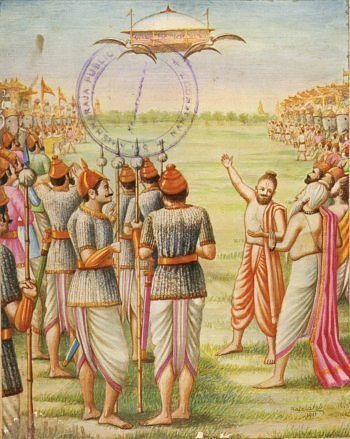 The Amaranganasutradhara even explains the drive, the controls and the fuel for the flying machine. It says that quicksilver and ‘Rasa’ were used. Unfortunately we do not yet know what "Rasa" was. The texts also explained how to clean metals, the acids such as lemon or apple to be used and the correct mixture, the right oils to work with and the correct temperature for them. Seven types of engine are described with the special functions for which they are suited and the altitudes at which they work best. The catalogue is not short of data about the size of the machines, which had storey, nor of their suitability for various purposes. "The pilot should have had training in maantrica and taantrica, kritaka and antaraalaka, goodha or hidden, drishya and adrishya or seen and unseen, paroksha and aparoksha, contraction and expansion, changing shape, look frightening, look pleasing, become luminous or enveloped in darkness, deluge or pralaya, vimukha, taara, stun by thunderstorm din, jump, move zig-zag like serpent, chaapala, face all sides, hear distant sounds, take pictures, know enemy maneuver, know direction of enemy approach, stabdhaka or paralyze, and karshana or exercise magnetic pull"
Tripura Vimana: Perspective and Vertical Section1. Goodha: As explained in 'Vaayutatva-Prakarana', by harnessing the powers, Yaasaa, Viyaasaa, Prayaasaa in the 8th atmospheric layer covering the earth, to attract the dark content of the solar ray, and use it to hide the Vimana from the enemy. Drishya: By collision of the electric power and wind power in the atmosphere, a glow is created, whose reflection is to be caught in the Vishwa-Kriya-drapana or mirror at the front of the Vimana, and by its manipulation produce a Maaya-Vimana or camouflaged Vimana. Vimukha: As mentioned in "Rig-hridaya", by projecting the force of Kubera, Vimukha and Vyshawaanara poison powder through the third tube of the roudree mirror and turning the switch of the air mechanism, produce wholesale insensibility and coma. Roopaakarshana: By means of the photographic yantra in the Vimana to obtain a television view of things inside an enemy's plane. Stabdhak: By projecting apasmaara poison fume smoke through the tube on the north side on the Vimana, and discharging it with stambhana yantra, people in enemy planes will be made unconscious. Chaapla: On sighting an enemy plane, by turning the switch in the force center in the middle section of the Vimana, a 4087 revolutions an hour atmospheric wave speed will be generated, and shake up the enemy plane. Parashabda Graahaka: As explained in the "Sowdaaminee Kalaa: or science of electronics, by means of the sound capturing yantra in the Vimana, to hear the talks and sound in enemy planes flying in the sky. Dhundinaatha and "Valalmeeki Ganita" state that Rekha has 7,03,00,800 air routes. One of the studies on the scripts notes that it referred even to aerial combat features, evasion tactics, support systems and air defence techniques through enemy detection which are all needs of modern air forces of the world. 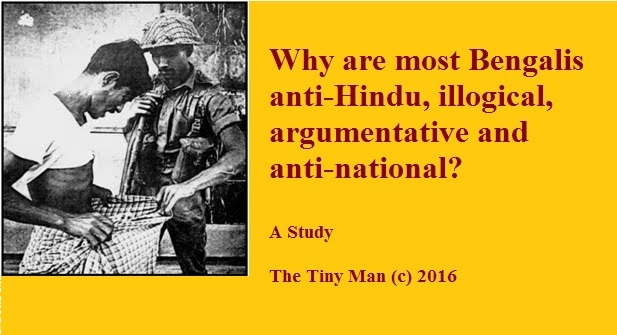 Most descriptions available are short and introductory in nature but experts like Air Marshal M Matheshwaran, in their studies, have said that there may have been more description and detailed ideas in subsequent texts. 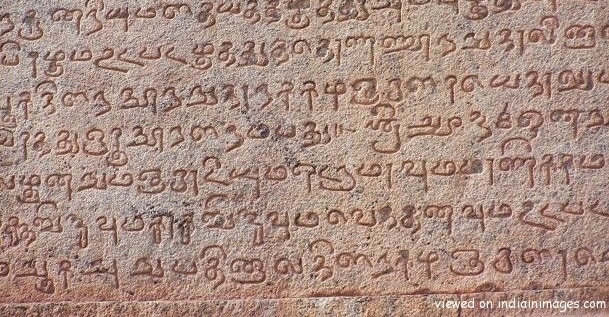 Unfortunately, lack of good research into our history and the missing texts experts say, are among reasons why India has not been able to capitalize on ancient knowledge. That's it. Thank you for reading "Vimana Shastra by Bhardwaj Rishi - Secrets of Ancient Indian Flying Machine". Please show your appreciation by sharing and/or leaving a comment. Now that is quite a well-researched post. Have heard so much about this shastra and glad to catch it here. Reminds me of the Alexander novels that I just read. We all know what Ramayana and Mahabharata have shown us about flying charriots other such stuff. But this post is amazing. I am not more interested in knowing what did else we (early age) Indians know about other sciences. Really! Dear Subhodeep ji the viman was made of (the machine) Gold,silver and iron, and had two wings. What was the engine used, what was the fuel used. Pl find some more on this issues. More so, Gold, Silver and Copper are all examples of Native metals that naturally occur in a relatively pure state. 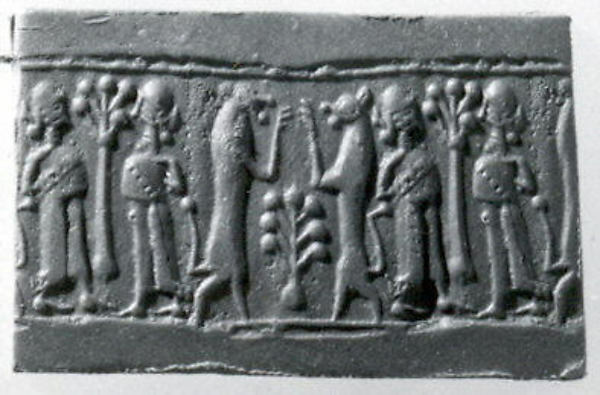 Ancient man first found and began using these Native Metals approximately 5000 years BC.(https://www.azom.com/article.aspx?ArticleID=6101). Gold, Silver, Copper, Tin, Lead, Iron. Do you believe in this mythological issues like flying machines. Because you said in an another web: (https://www.azom.com/article.aspx?ArticleID=6101) not believer of God but on Science. Science needs evidences which is reproducible/repeatable. Pl.enlighten me. Very true. Some of this is really old. Thanks for reading and sharing your thoughts! Wow, Subhodeep! This is brilliant and I'm sure you've worked really hard researching this. We need more of these kinds of articles. Take a bow! If you haven't watched 'Ancient Aliens' on Discovery, you should. You'll really like it. Thanks a lot! I'll definitely watch 'Ancient Aliens'. Happened to stumble on this. Superb article stuffed with interesting and useful info. Your posts are always like that. Loved it.....just imagin, so much is there to explore, to know about science , technology and a rich culture we used to have where every single thing is based on fact. I want to down this information how it is possible plz tell me. Where all such knowledge vanished... it seems like science fiction really. Thank you for sharing your views Mr Mukesh Maharana. Please send me this details in pdf. Format at rajan509833@gmail.com. Why is there a picture of ancient Hieroglyphics (from Egypt perhaps) in the Ramayana Section? Also Vedas don't contain diagrams but only hymns (not said in your blog but many blogs on the net say that these diagrams are in Vedas). Hence all the translation from Sanskrit is the key to understand what the hyms actually mean. Now, i have tried to read the Vedas, i dont understand Sanskrit well, so tried the next best thing, English and Hindi translations. These translations seem quite meaningless, at least to the ordinary reader like me, in terms of scientific details. Given that the translations of Vedas into other languages is rare, and that the translations themselves depend on translator's view of the hymn, i think sometimes we go too far in terms of claiming such scientific feats. Of course its possible that its true, but its unsettling to see how easily people are willing to believe any claim without any questioning.